A left-hand wind palm-sized bait caster reel with a machine-balanced aluminium spool, infinite anti-reverse, facilitated by an anti-reverse bearing opposed to a clicker that might jam. It has magnetic brakes and 3 ball-bearings (3 genuine ball races, not imaginary ones or a count of the ball-bearings in one race. like so many other reels on the market) with a twin thumb grip handle, 5.1:1 retrieve ratio with a line capacity of 200m or 20lb (S-line or whiplash) or 100m of 50lb. This multiplier reel has easy access, push button side plate for oiling/greasing the gears & general running maintenance. 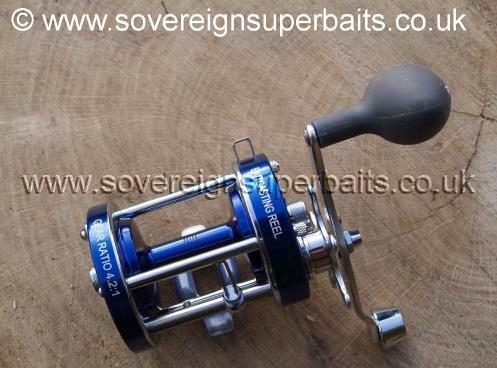 This reel is extremely keenly priced in today's market, we have sold 500+ and not one complaint or return. The Banax Tova 300L is exactly the same as the Rozemeijer Sonar II except for the handle and the graphics / printing on the reel. When Ultimate Hengelsport, owner of the Rozemeijer brand went bankrupt for the second time in 2010, Banax had to find a market for the thousands of Rozemeijer reels already manufactured, Patents and trademark restrictions prevent them from using the Rozemeijer name or the signature rosewood torpedo handles. The Rozemeijer Element is not only stylish but impeccably well constructed with around 100 separate components. A full anti-reverse backlash system, one piece aluminium diecast frame, spool machined from one piece of aluminium with centrifugal brakes to control backlash. These are the latest offering in a long line of incredibly well designed and constructed reels from the Rozemeijer stable. The Rozemeijer Element 5500 has a line capacity of 200m 0.20 braid, 165yds 12lb mono. It runs on 4 ball bearings and has a 5.1:1 retrieve ratio. We have fitted exactly 100m of 55lb Power Pro / Bobcat braid on this reel. 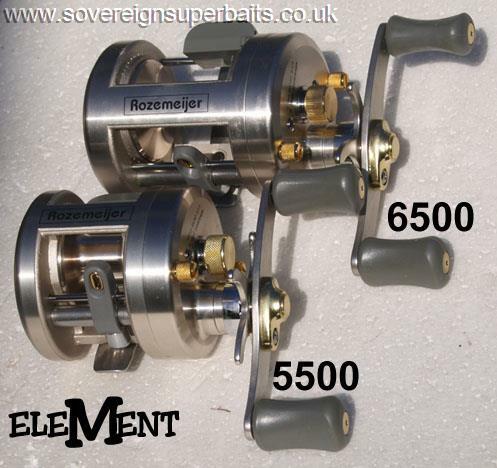 The Rozemeijer Element 6500 has exactly the same high spec as the 5500 but with a larger body and spool, giving it an extended capacity of 300m 0.20 braid, 225yds 12lb mono. We have fitted 100m of 80lb Power Pro / Bobcat braid with a few yards of mono backing on this reel. 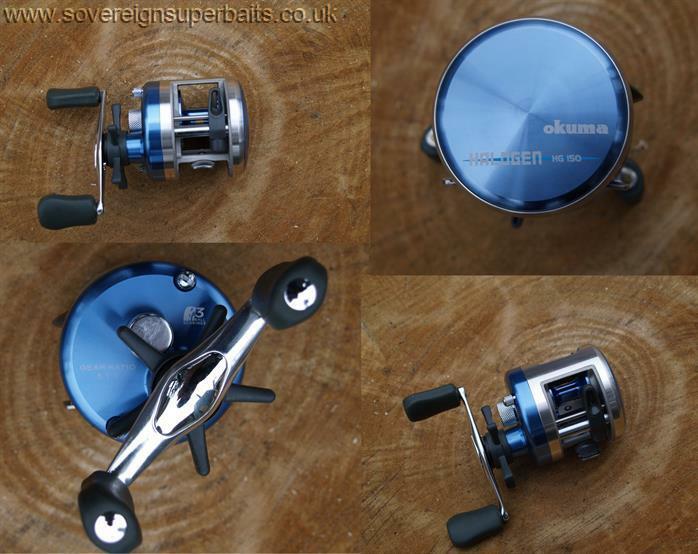 This is an Okuma Halogen 150 baitcaster, an excellent baitcaster reel with all the quality features of a far more expensive reel. Machined and anodised aluminium spool, ultra fine adjustable star drag, two stainless steel ball bearings plus one one-way quick set clutch bearing, ultra light one-piece aluminium frame, all anodised for corrosion resistance. 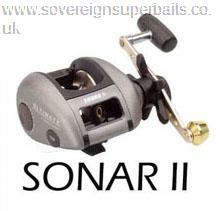 Capacity: 180 yards 10lb mono or equivalent. 5.1:1 retrieve ratio, total weight 307g. This reel was designed for the Japanese market and we have managed to acquire a supply of these through the back door. A fantastic reel at a fantastic price. A great new light boat/casting multiplier from Fladen in Left hand wind ! 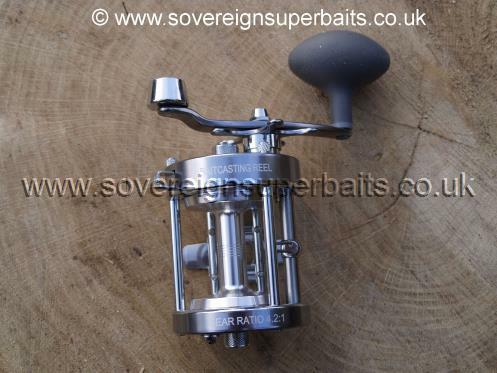 It is smooth & precise, & nice to use, has an over sized handle which is great when fishing deep water, nice & comfortable for the long wind up. The level wind goes all the way across & doesn't miss the edges like some reels out there.